What is an Electronic Letter of Credit? An electronic letter of credit can be defined as a letter of credit transaction, which is carried out entirely on electronic means of communication and issued according to the rules, such as an eUCP, which are allowing electronic presentations. Introduction: The information technology revolution and advancements in the international maritime business have changed the way of doing business in cross border trade. We have been enjoying a new type of international business thanks to the advancements in both logistics and communication sectors. Importers can easily subscribe to www.alibaba.com in order to find a reliable supplier who will offer good quality goods with competitive prices. By signing a sales contract or preparing a simple proforma invoice the importer and exporter can determine the delivery term and the payment method. After arranging the transportation and taking care of the insurance and custom clearance, the operational side of the deal is completed. You can order any kind of goods internationally by online means without knowing who your supplier is or another party that has been participating in that particular export import business. Everything could be handled by electronic means of communication fast and secure. Preliminary Works: In order to make international letters of credit more compatible to this challenging electronic business environment, the ICC Banking Commission started to work on electronic letters of credit rules in year 2000. The aim of the ICC Banking Commission Working Group, which consisting of experts in the UCP, electronic trade, legal issues and related industries, such as transport was to carry out the documentary credits rules into electronic environments where electronic presentations are possible without the need of any paper based documents. Rules: (eUCP): In year 2002, the Banking Commission created supplementary rules to UCP 500 which, enabled the presentation of electronic records alone or in combination with paper documents. 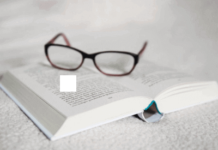 The supplementary rules are known as the “Supplement to the Uniform Customs and Practice for Documentary Credits for Electronic Presentation” or simply “eUCP“. eUCP came into effect on 01.April.2002. Revision of the eUCP: UCP 500 revised in year 2007 and UCP 600 replaced the previous version of the letters of credit rules. Along with UCP 500 revision ICC banking commission made necessary amendments on the eUCP rules. As a result in year 2007 eUCP V1.1 Supplement to UCP 600 replaced the older version of eUCP which was known as eUCP V1 Supplement to UCP 500. 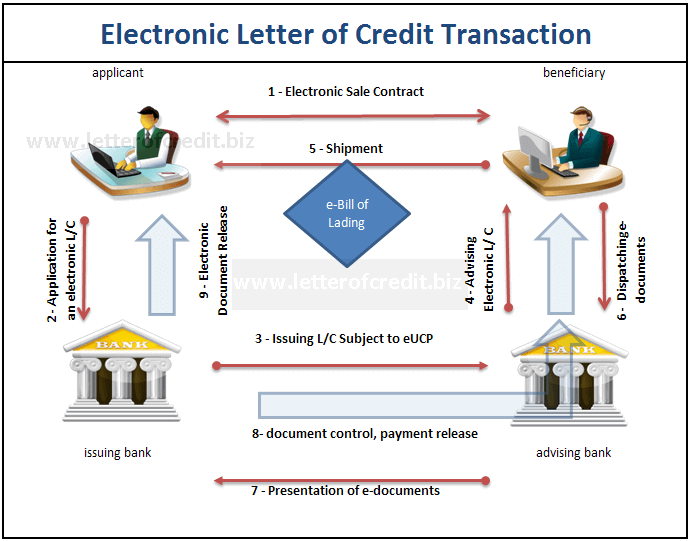 Let us have a look at the electronic letter of credit rules in detail. 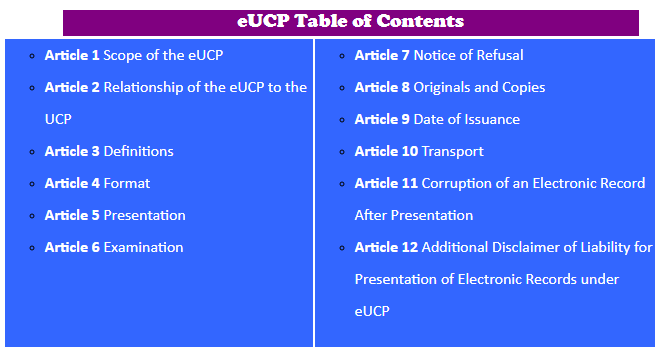 eUCP V1.1 Supplement to UCP 600: UCP 600 contains within its text the 12 Articles of the eUCP, ICC’s supplement to the UCP governing presentation of documents in electronic or part-electronic form. When you are buying UCP 600 from the ICC bookstore, you will also be buying supplementary eUCP rules as well. 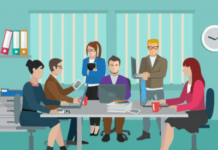 How Electronic Letters of Credit Work? Under electronic letters of credit all letters of credit parties such as the beneficiary, applicant, issuing bank, advising bank and confirming bank must be connected to the same secure online platform which enables electronic presentations and electronic document examinations. GlobalTrade Corporation and The Bolero Ecosystem are top two companies throughout the world offering secure multi-bank platforms. Electronic letter of credit transaction starts with the signature of the sales contract between the exporter and the importer through secure online platform. 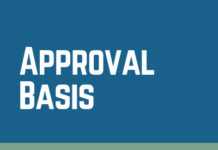 The applicant (importer) applies to the issuing bank for opening an electronic letter of credit which should be subject to latest version of eUCP rules. The issuing bank issues its electronic letter of credit and send the credit to the advising bank through multi-bank platform. The beneficiary (exporter) of the electronic letter of credit receives the authenticated copy of the e-credit through the secure online multi-bank platform. 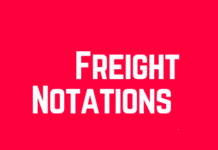 At the same time the applicant (importer) applies to the transport company, to make sure that an electronic bill of lading will be issued instead of a regular paper based bill of lading. The beneficiary make the electronic presentation to the advising bank. Electronic presentation contains electronic documents including digitally signed e-bill of lading. Advising bank checks the documents. If documents require no correction then advising bank make the electronic presentation to the issuing bank. Issuing bank checks the documents. If documents are found to be complying then issuing banks issuing bank honors its letter of credit. Issuing bank sends e-documents to the applicant. International courier costs: In each set of documents you submit to your bank under a paper based letter of credit, you should be paying between 75 USD-100 USD. You could save this amount with electronic L/Cs. Domestic Document Gathering Costs: Most of the export and import documents are created quite far away from the manufacturing companies, as production plants are located away from the city centers, where the land prices are low. Some documents are created at the custom offices which are located just inside the port of discharge. Collecting different paper based documents from different locations may cost considerable amount of money, especially when the exporters are racing for a timely presentation under the letters of credit. Financial Advantages: Financial gains as a result of using electronic letters of credit could be sum up under below points. Reaching to the Payments Faster via Online Presentations: Under paper based presentations, the beneficiaries could collect all required letters of credit documents within 4-5 days after the date of shipment. Documents could reach to the issuing banks or confirming banks via expedited courier services between 3-7 days under normal conditions. (You should always think about strikes and holiday periods also extreme conditions where air traffic is severely affected such as eruptions of Eyjafjallajökull volcano in Iceland resulting at least 20 countries closed their airspace to commercial jet traffic for a period of week between 14–20 April.2010.). In conclusion, it is fair to expect under an at sight letter of credit, which allows paper based presentations, the beneficiary could reach to the payment within 12-20 days after the date of shipment. On the other hand, the beneficiary may be able to reach to the payment under an electronic letter of credit, which available by at sight within 3-4 days after the date of shipment. Benefits of Reduced Risk Levels: Electronic letters of credit could eliminate or at least reduce various risks of the exporters, importers as defined below. Electronic Documents can be corrected easily which makes them less risky in terms of refusals by the issuing banks: Corrections on electronic documents is easier and faster than paper based documents. As a result exporters’ presentation refusal risks reduced significantly. According to ICC data %70 of presentations have been refused by issuing banks on 1st presentation. Electronic presentation could reduce these rejection figures considerably. Documents reach to Issuing Bank Earlier: In some occasions the distance between exporter’s country and importer’s country is quite short that paper documents could reach to the issuing bank long after vessel arrives to the port of destination. Such a situation could create couple of problems that may be causing extra risks and costs to both exporters and importers as highlighted below. Bolero has announced the first fully electronic presentation into mainland China of documents under a Letter of Credit, using the Bolero platform. This is the latest in a series of major milestone achieved by the participants in this transaction. The electronic presentation related to a shipment of manganese ore from Australia to China. 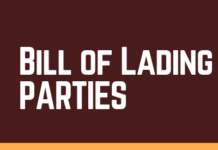 As a fully end-to-end electronic presentation including the Bolero eBL (electronic bill of lading), all parties were connected to the Bolero platform. BHP Billiton was the exporter and beneficiary of the Letter of Credit; the customer and applicant was Sichuan Emei Ferroalloy I/E Co., Ltd. and ANZ bank acted as the advising bank, with China CITIC Bank acting as the first ever Chinese ePresentation receiving bank. The shipping company was “K” Line Pte Ltd. The Letter of Credit was issued under eUCP and all documents required under this Letter of Credit, including the bill of lading, were presented electronically using the Bolero platform, supported by the unique Bolero legal rule-book. A number of electronic presentations using Bolero have been undertaken elsewhere in Asia, but it is particularly significant to be able to prove acceptance in mainland China, a key export market for the resource industry. Being the first end-to-end electronic presentation into China, this also achieved a number of significant milestones: the first eBL into China with resultant cargo release and customs clearance, the first local Chinese Bank receiving a fully electronic presentation and the first Chinese corporate customer receiving an electronic presentation and surrender of an eBL. In this transaction, the customer, Sichuan Emei Ferroalloy I/E Co., Ltd., applied to China CITIC Bank for a Letter of Credit (L/C) to be issued under eUCP with BHP Billiton as the beneficiary. The L/C was advised to BHP Billiton using the Bolero export L/C management solution. The Bill of Lading was created on Bolero and made available to BHP Billiton to include in their electronic presentation. BHP Billiton did a fully electronic presentation of all documents required under the L/C to ANZ bank. 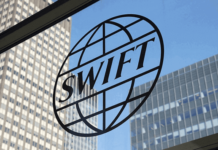 Following confirmation of compliance by ANZ bank, the electronic presentation was then forwarded over Bolero to the issuing bank, China CITIC Bank, and subsequently forwarded over Bolero to the customer, Sichuan Emei who surrendered the eBL to “K” Line. This program proved the ability to drive the presentation end-to-end through to being promptly honoured and paid by the issuing bank. Special thanks to Tom Rahder from www.bolero.net for his great contribution to this article.